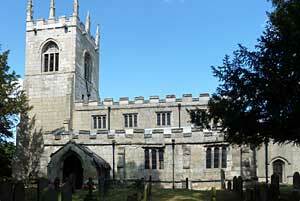 No church is mentioned in Walkeringham in Domesday Book. The current stone building dates from the early 13th Century, the largest remaining portion being the nave arcades. 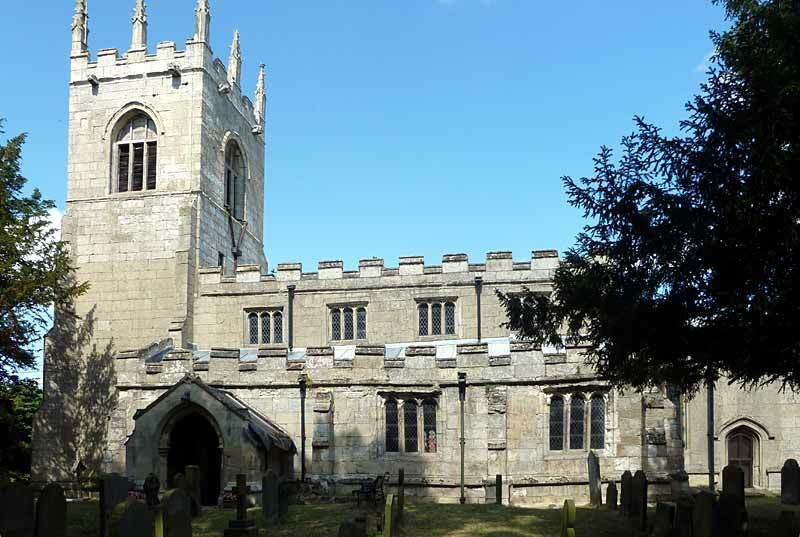 It consists of chancel, clerestoried nave, aisles, south porch and embattled western tower with 8 pinnacles, containing a clock and 3 bells dated 1586, 1606 and 1809. The tower was built in the 15th Century of local Roche Abbey stone. The aisle arcades are almost identical with octagonal piers, 13th Century capitals and odd square ‘broached’ bases. The arcade to the north chancel chapel is also 13th Century. Perpendicular in style are the nave and chancel roofs (with carved bosses), the tower arch and the clerestory which has four windows on the south side and three on the north. The east window is also Perpendicular, now with plain glass. There are three mid-Victorian stained glass windows on the south side. The monument to Francis Williamson (d1639) was sculpted by Edward Marshall in 1659 and stands in the north chancel aisle. Two life-size kneeling figures face each other, and below them three kneeling children. Part of the oak rood screen was removed by a former vicar to form the priest’s vestry, but the base is still in its original position. The font is a simple octagonal bowl, dated 1663. Also 17th Century is the plain octagonal pulpit.